This kind of Magic falls into a category known as Synergistic Magic which works upon the basic concept that there is a direct relationship between the spirit of a thing, its identity, its nature, and qualities and the effect that Spirit has upon the the physical world of matter. The nature and quality of each Spirit shifts the vibrational quality of other spirits. The specific reality one seeks to bring about then emerges as a quality of being between spirits in a dialogue. In a practical sense, this means you assemble within the Mojo/Wish bag multiple objects, herbs, and other such things that carry very specific qualities of spirit. The collection of such vibrational objects is brought together to form a singular unified expression of quality and power to deliver the spiritual clout to bring about a deliberate shift in some specific quality of reality surrounding a specific person. The bag can be marked or embellished in a number of artful ways, or left plain. The colour of the bag sometimes plays a part in the spirit quality, aiding in identifying the specific goal or target for a particular working. Individual elements within the bag may be worked independently before being added to the mix. Each object requires its own particular approach, so as to further draw out its active quality and participation in the work at hand. To finish setting your bag, you may lend it fire to bring it to life and charge it further to its task. You may also expel your witch’s spirit breath, your own wind of creation, into the bag of Magic. Then a Mojo/Wish bag may be set to a specific person, in any number of ways. And is often carried close to the skin for a period, so as to attach the qualities of the bag spirits to the wearer’s own being and circumstances. The bag can also be put in a place safe and/or sacred to its owner. A place of power is preferable, often hidden. A good bag is never messed with or adjusted. It is built and set to a singular purpose and goal and should never be worked to any other task. If a good bag is no longer needed, its task having been accomplished, then wrap the bag in some clothing of the owner and hide it away for future use. A good Mojo may be given to another as a gift, and good wish bags might be handed down within a family like any other powerful magical artifact. There are many tasks and goals that a wish bag might be set to. This kind of flexible and powerful form of magic is an old and true art form of cunning. To learn more, seek out classes on practical magic or pick up a book or two. 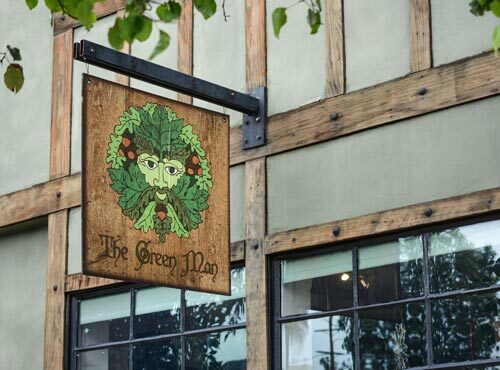 At The Green Man we have a large selection of appropriate objects, stones, herbs, and other accouterments used in the fixing of Mojo/Wish bags. For those who would rather have someone else set a Wish Bag for them, we offer a full range of Magical SpellCrafting services. However, we refrain from using magic to usurp the liberty and free will of anyone other than the client themselves. Keeping the magic clean, pure and potent!